2. Saute the vegetables, breadcrumbs, red chilli powder and salt for a minute or two. 3. Add little water to the maida and mix well to a chapati dough consistency. 4. Pinch small balls of the dough and roll them into small circles. 5. Place a tsp of the vegetables and roll it up. 6. Seal the edges by using little water and keep aside. 7. Heat oil for deep frying and fry the prepared rolls till golden brown. 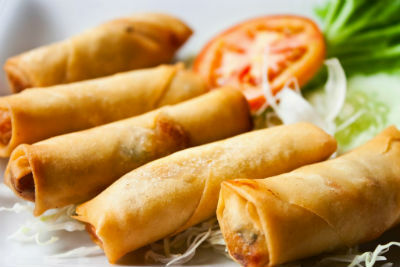 Feel free to comment or share your thoughts on this Bread Spring Rolls Recipe from Awesome Cuisine.